For GMO’s identified, that have a tolerable limit Quantitative real-time PCR is utilized to determine the GMO % present. The live webinar was on March 13 at New Foods Magazine but you can always watch it on demand here. 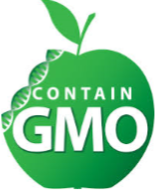 Don’t hesitate to reach out to us with any questions regarding GMO testing at nquacdublininfo@us.nestle.com. In 2018, NQAC Dublin began hosting Customer Days throughout the year to share our lab and create lasting connections with our customers. With the excellent feedback we received from those that attended, we are excited to announce this program will continue through 2019! Our first Customer Day of the year will be Tuesday, March 26th. We look forward to meeting you! At the end of 2018, we conducted our yearly NPS Survey and received helpful feedback from our customers. We consider all responses and this feedback helps us drive continuous improvement. Thank you for your feedback and participation in the survey. If you have suggestions about how we can improve our services, please reach out to us at NQACDublinInfo@us.nestle.com. With the introduction of allergen testing last year, NQAC Dublin has been continuously working to expand our capabilities and accommodate as many allergen screens as possible. We are very excited to announce the addition of two new allergen screens to our portfolio: Sesame and Pecan. Sesame Allergen testing is validated for cookies, spices, sauces, coffee, infant formula, cereals, and environmental swabs. Pecan Allergen testing is validated for cake, cookies, chocolate, ice cream, and environmental swabs. Please reach out to Customer Service at NQACDublinInfo@us.nestle.com with any questions about these new methods! The 39th Annual Refrigerated Foods Association (RFA) Conference in Tampa, FL was a great success. This year’s conference featured a line-up of expert speakers discussing current issues in food safety and manufacturing, networking opportunities with industry leaders and an exhibition reception. This year, NQAC Dublin had the opportunity to participate as an exhibitor and see the latest innovations in ingredients, equipment, packaging and services for the refrigerated foods industry. We had the opportunity to meet with several CEOs of Manufacturer member companies in a one-on-one session to learn about their company’s specific needs. Our team thoroughly enjoyed this year’s conference and the opportunity to meet many industry leaders! We look forward to attending the 40th Annual RFA Conference in Orlando, Florida next year! In Food Safety, Preventative Action is Key! Since 2012, food recalls and withdrawals have risen by 92.7% and have cost companies millions of dollars in lost revenue as well as negatively impacted their brand reputations. There is evidence, however, that when managed properly the negative impact to their brands was only temporary. Reports indicate that a contributing factor to the increased number of food recalls is consumer awareness. Consumers today have unlimited access to information, have become more conscious about the quality of their food, and expect that companies should be held responsible and react to food safety issues swiftly. A FoodLogiQ survey revealed that consumers expect that a recall should be resolved in as little as 1 to 2 days. Additionally, consumers expect to be kept up to date with relevant information throughout the food safety issue. When companies comply with the above consumer expectations, they can decrease the negative impact of the event to their brand reputation. While it is important to act fast and take communication seriously during a food safety issue, a preventative approach is the best option. 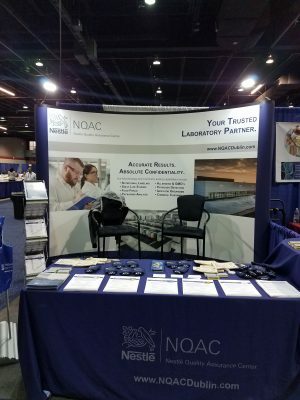 At NQAC Dublin, we are dedicated to providing the highest quality analytical testing to help keep your consumers safe and your brand trusted. Please contact us at nqacdublininfo@us.nestle.com for more information on how we can support your business. NQAC Dublin Director, Fabien Robert, enjoyed sharing his expertise on Food Safety as a presenter and a panelist at the 7th Annual American Food Sure Summit. The event hosted industry leaders in Food & Beverage from across North America and focused on the latest in food safety, quality, compliance, regulation, food supply chain, manufacturing and technology. We appreciated the opportunity to speak, network and gain insights from other industry experts and are looking forward to next year. Are you ever in need of a different protein factor than what is reported? We recently added a Protein Factor Conversion tool to make it easy for you to do the conversion. We are very excited to begin offering a 72 Hour Environmental Swab option to provide more flexibility when shipping environmental monitoring samples to NQAC Dublin. If you work in a food setting, chances are that you are familiar with environmental monitoring. You are also most likely familiar with the potential difficulties of ensuring your environmental swabs viability prior to testing. The current industry standard is to complete testing within 48 hours of environmental swabs being taken to ensure the viability of bacteria and avoid false negatives, as well as due to the potential for bacteria to increase or decrease over time. This short window of time can present issues. 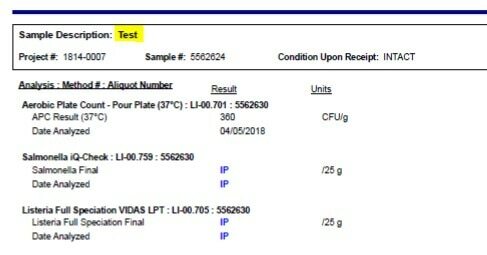 With this, NQAC Dublin worked to validate the use of HiCaP Neutralizing Broth to provide more flexibility with a 72 Hour option for Environmental Swabs. In order to take advantage of this new 72 hour testing option, specific materials will need to be purchased directly from World Bioproducts. Foreign Material? We Can Help! Despite manufacturers taking as many precautions as possible, there are still instances of foreign bodies found in products by consumers. Several recent advances in technology can aid in the identification of these foreign substances, such as Fourier Transform- Infrared Spectroscopy (FT-IR) and X-ray Fluorescence (XRF) technologies. These techniques involve testing a sample of the foreign material found in a product as well as a suspected source material sample. Once testing is complete, the characterizations of these two materials are compared to determine the degree of similarity and identify the area of the manufacturing line where the foreign body was possibly introduced. But what if the source of the material is unknown? One way to address this issue is by developing a materials characterization library for your manufacturing site. The library is created by mapping the materials used in manufacturing line parts and testing a representative sample of each of these materials. Then, if an instance of a foreign body within a product occurs, analysis of the sample can be completed and compared with the materials library for source identification. Even if you do not have a foreign body currently that needs investigation, we can go ahead and get a head start on creating a library by line mapping your facility. Your materials characterization library will be ready if you do run into a foreign body issue at a later time. We can help you be prepared for the year ahead. If line mapping and the creation of a materials characterization library are services that you are interested in, a member of our NQAC Dublin team would be more than happy to discuss your needs in greater detail and answer any questions. We are excited to share some recent news articles that we had the honor of contributing to in December. New Food Magazine: Microbiology In-Depth Focus 2018, Quality Assured. The Nestlé Quality Assurance Center in Dublin, Ohio, USA is regarded as setting industry standards when it comes to state-of-the-art facilities and technical sophistication. Here, Zone AMS NQAC head, Fabien Robert, tells New Food about the centre’s work and plans for the future. Wall Street Journal: Probes of Foodborne Illness Outbreaks Multiply as Technology Improves. Nestlé SA, the world’s biggest food and beverage company by market value, has itself begun using genome sequencing to determine where bacteria discovered in a finished food product came from, said David Clifford, Nestlé’s U.S. food-safety director. The maker of Dreyer’s ice cream and Hot Pockets is working to build closer relationships with suppliers, in part to help it craft more effective food safety programs. The company has doubled its supplier management team in the past three years. “We are trying to find out where vulnerabilities exist and determine what we need to do to eradicate them,” Mr. Clifford said. Over the past six years, NQAC has taken a number of steps to reduce our environmental impact. Our company earned this award for our emphasis on waste diversion from landfills and energy efficiency. Check out this press release for additional details on the award and our waste reduction and energy efficiency projects. In 2011, the Food Safety Modernization Act (FSMA) provided the Food and Drug Administration (FDA) with the authority to mandate food recalls. Prior to FSMA, recalls could only be initiated voluntarily by companies. This is still true today, the FDA typically relies on companies to voluntarily recall their products but can now use its authority to mandate a recall if necessary. They have only mandated a food recall once in the past seven years since they were given the power. NQAC Dublin’s commitment to customer satisfaction has allowed us to further improve our services while offering another year with no price increases!! We are very happy to share that 2019 will be the sixth year in a row that we have not increased our prices for our testing services! We are continuously developing our Allergen Portfolio and are happy to announce that on December 10th 2018, we will be offering lower costs for these methods! Additionally, we will now offer Crustacean and Hazelnut Allergens into our portfolio. Crustacean has been validated for finished food products, dairy products, cereal grains and environmental swabs. Hazelnut has been validated for cookies, chocolate bars, ice cream, cereals and environmental swabs. Lower cost for Non-GM Samples! Increased ability to detect the widest range of GM-events! Identification of additional events which includes 5 GM-maize and 5 GM-soya! The new qualitative “GMO screening by FAST Real-Time PCR” (LI-00.047) will detect if the most common GM-markers are present. This screen can detect greater than 95% of plant GMO’s being cultivated today! If your results are found as “Not Detected”, no further testing will be required. If one or more of the GM markers are “Detected”, we will automatically analyze the sample using “GMO Identification by RTi-PCR” (LI-00.386). This identification method allows for the qualitative detection of 6 plant species and 6 GM-markers in addition to the specific identification of 21 GM-maize events and 14 GM-soya events. The turnaround time for the initial screen and identification method will be 14 days or 7 days rush, which includes the day of receipt and weekends. Consumers are calling for more and more transparency about what constitutes their food. For those with allergies, knowing what is in their food is extremely important so that those foods can be avoided. To help those with allergies not to limit the foods that they are eating out of fear of exposure, the FDA is looking into measures to require the declaration of Sesame on labels. Allergy labeling is currently only needed for milk, egg, fish, shellfish, tree nuts, peanuts, wheat, and soybeans. NQAC Dublin has an extensive list of Allergen tests that we offer either at our laboratory or through a partnership with an approved third-party laboratory. Almond, Cashew, Clam, Beta-lactoglobulin, Egg, Gluten, Hazelnut, Milk, Mustard, Peanut, Pecan, Sesame, Shellfish, Shrimp, Soy and Walnut. A new method offering of Robinson Sensory Analysis is now available at our location as Taint Transfer from Packaging to Food. The analysis is aligned to ISO 13302 and EN 1230 standards. The Robinson test determines whether a flexible packaging material (e.g. paper or board) contains substances, which could potentially be transmitted through the air space into your product (e.g. chocolate) and affect its taste. A packaging sensory panel will be used to score the intensity of the submitted sample from 0 to 4, compared to a reference test portion with an intensity value of 0. The median score is then reported, with samples scoring 2.5 or higher considered to be of doubtful quality. Our Vitamin conversion tool is also now available online! Do you ever need help converting your results into different units of measure? We recently added the Vitamin Unit of Measure Conversion Calculator to make this easier for you! By simply entering your reported results into the designated cell on the spreadsheet, the tool will automatically convert the reported results to your desired unit of measure. If you have any questions on where to find the tool or how to use it, please reach out to Customer Service and we will be happy to help. The Vitamin Unit of Measure Conversion Calculator is now available with our other “Help Guides” within the education and resources page on our website and can be found here: https://nqacdublin.com/education-and-resources/. Foreign Body Investigation? We’ve Got you Covered! While microbiological and chemical hazards are the most well-known food safety risks, physical hazards pose a potential threat and are also a source of consumer dissatisfaction. These physical hazards can be pieces of product that are not properly homogenized, pieces of processing equipment that have broken off, or substances introduced by the consumer on accident. An incident related to a foreign body can cause a company significant financial losses resulting from lawsuits and loss of consumer trust. Recent advances in technology have aided in the identification of foreign bodies. Two techniques used for identification at NQAC Dublin are Fourier Transform- Infrared Spectroscopy (FT-IR) and X-ray Fluorescence (XRF). FT-IR takes advantage of the reaction of certain chemical bonds in organic molecules with specific wavelengths of light. This pairing of chemical bonds to wavelengths of light produces a characteristic peak that is used to identify the composition of a sample. This technology is most useful in applications where the particle in question is suspected to be an organic material. XRF, on the other hand, is more advantageous when looking at a foreign body suspected to be a piece of glass or metal. This technology takes advantage of the fact that each element causes X-rays to exhibit different energies when irradiated with an electron beam. Each element emits its own, unique energy which allows for the identification of different materials. Different manufacturers of these materials use different levels of elements which allows the source of the contamination to be pinpointed. Our team can also go a step further and do line mapping in your factory to create a library that will be useful in determining the source of the foreign body in question and also be used if there is ever a future investigation needed. If you are interested in our Foreign Body Investigation, please reach out to us at nqacdublininfo@us.nestle.com. NQAC Dublin was pleased to host 30 honor students from Columbus State Community College this fall. During their visit, the students enjoyed a tour of the laboratories and spent time with our Chemistry Manager (Becky Melick), Microbiology Manager (Brittany Pace) and Human Resources Manager (Joe Walter). Our team enjoyed meeting the students and focused on educating them on potential careers in food science. Also, we wanted to introduce the many career paths and opportunities available within Nestlé globally, in the US, and locally within NQAC Dublin. This visit and the information exchanged will potentially help students understand and choose a career path in food science and will also help ensure Nestlé Quality Assurance continues to attract talent that delivers the highest quality analytical results to all customers. Thank you Columbus State for this opportunity! According to the Centers for Disease Control and Prevention, Salmonella causes approximately 1.2 million illnesses a year. The severity of these illnesses range from symptoms resolving without treatment within a few days to hospitalizations and, in extreme cases, death. Salmonella can infect anyone. Children under the age of 5, adults over the age of 65, and people with weakened immune systems are at the highest risk for severe illness. So far this year there have been 12 reported Salmonella outbreaks. This is a significant increase from the amount of reported outbreaks in 2017. Salmonella is most commonly associated with raw or undercooked meat, eggs, and poultry. Many would be surprised to discover, that two of this year’s outbreaks are linked to breakfast cereal and pre-cut melon. The outbreaks linked to cereal and pre-cut melon have affected over 200 people in 38 states. The impact of Salmonella outbreaks is not limited to public safety. To mitigate the food safety risk presented by these outbreaks, manufacturers often issue product recalls, which are likely to have financial and brand trust impacts as well. Testing the ingredients and foods for potential food safety issues, such as Salmonella, other pathogens and physical hazards, are a large part of what we do here at NQAC Dublin. Contact us at nqacdublininfo@us.Nestle.com for more information on how we can support your business. New Method for the Analysis of Aminoglycosides! If you have any questions about the above offerings, please reach out to our Customer Service team for assistance! September is National Food Safety Month (NFSM) and gives us a great opportunity to highlight the importance of food safety and our commitment to quality. Food safety is at the forefront of everything we do. We understand the responsibility associated with food safety testing and the importance of ensuring that the food, beverages, and ingredients tested in our facility are held to the highest standards. What is the cost of food safety? Whatever the investment might be to create a culture of food safety within your business, it does not compare to the costs of a food product recall and the potential loss of trust from consumers. The Food Marketing Institute estimated that the average direct cost for a food recall in the US was $10 million and this number does not include indirect costs such as those associated with lawsuits, loss of sales, or damage to reputation. Our commitment to quality and reliable results is embedded in our work and demonstrated daily by our staff, so that our customers can feel confident in the results they receive from NQAC Dublin. NFSM was created with a focus of increasing awareness of the importance of food safety through education. Check out our upcoming webinars, educational materials & resources page, to learn more about important food safety related topics. “Create A Culture Of Food Safety.” National Restaurant Association, National Restaurant Association, 30 Aug. 2017, www.restaurant.org/Pressroom/Press-Releases/National-Food-Safety-Month- Highlights-How-To-Creat. Ostroff, Stephen. “The Costs of Foodborne Illness, Product Recalls Make the Case for Food Safety Investments.” Food Safety Magazine, Food Safety Magazine, 2018, www.foodsafetymagazine.com/magazine-archive1/junejuly-2018/the-costs-of-foodborne-illness-product-recalls-make-the-case-for-food-safety-investments/. Is there a test that you need but you do not see it offered in our already extensive testing portfolio? Just ask us! We are continuously reviewing our method portfolio to meet customer requests and the changing market regulations. We take pride in listening to our customers and improving our services offered based on the feedback we receive. We strive to be the one stop shop for all your testing needs. If you have any testing suggestions or questions, please contact us at nqacdublininfo@us.nestle.com. One of our team members would be more than happy to assist to you! When most consumers think about food safety risks, their first thoughts are typically pathogens or unwanted chemical contaminants. And, yes, those are potential food safety risks, things we don’t typically want in the foods we eat and feed our families. Testing the ingredients and foods for these potential food safety issues are a large part of what we do here at NQAC Dublin. But have you ever thought about the packaging materials that are meant to protect the foods you eat? Have you ever considered that those packaging materials could be impacting the safety and quality of the food you buy? No? Well, we have. At NQAC Dublin, we have a portfolio of packaging tests used to identify potentially unsafe chemicals that could be coming into contact with the foods you eat. We perform packaging testing on an array of materials, including plastic, flex and cans. Our lab uses a variety of technologies to ensure the packaging that comes into contact with your food products are safe. 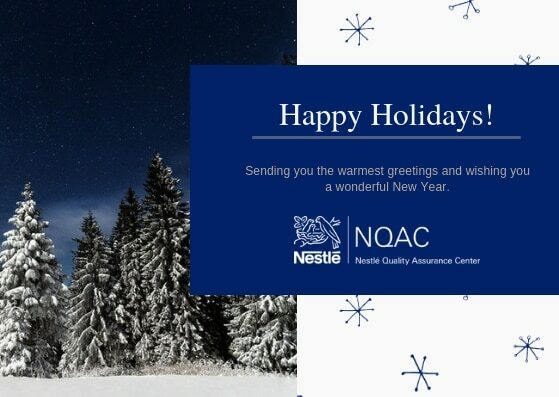 If you have questions about testing your packaging and the food products that packaging has come into contact with, reach out to us at: nqacdublininfo@us.nestle.com and one of our team members will provide additional information. This year’s annual International Association for Food Protection (IAFP) was another great success. Every year, the IAFP hosts an event focused on the latest food safety issues and the science and solutions centered on the problems facing our industry. Our team enjoyed networking and discussing pressing food safety issues with other professionals from all over the world. It’s always a great opportunity to connect with others in our industry and focus on new technologies that are available to help combat food safety risks. And once again, the agenda for the event did not disappoint. The presentations were led by renowned experts and covered a wide range of current food safety topics. We are looking forward to not only attending IAFP 2019 in Louisville, Kentucky, but also participating as an exhibitor. Our team is very proud to be a part of such an important organization. A collaboration between the FDA, SGS, Health Canada, and NQAC Dublin completed a comparison of analytical methodologies for the analysis of bound MCPD and Glycidol. This was presented by the FDA at the 2018 American Oil Chemists’ Society (AOCS) Annual Meeting in May. Process-induced chemical contaminants 3-monochloro-1,2-propanediol (3-MCPD) esters, 2-monochloro-1,3-propanediol (2-MCPD) esters, and glycidyl esters are formed in refined edible vegetable oils during the deodorization step of the refining process. As they are considered potentially carcinogenic and/or genotoxic, their presence in refined oils and foods may pose a potential health risk. For this reason, research efforts over the last several years have focused on developing methodology for the extraction and quantitation of these contaminants in oils, infant formula, and other complex food matrices in an effort to estimate levels of exposure. In addition, proposed EU regulations for bound 3-MPCD and glycidol concentrations in infant formula highlight the need for accurate analytical methodologies. Currently, there is no standard infant formula reference material containing known MCPD and glycidyl ester concentrations; therefore, verifying the accuracy of analytical methods has been difficult. This work compares a number of analytical methodologies for the analysis of bound 3-MCPD and glycidol in an attempt to confirm method performance. These analytical methodologies include those used by the U.S. Food and Drug Administration, Health Canada, SGS Germany, and Nestlé for the quantitative analysis of bound 3-MPCD and glycidol in various samples of oils and infant formulas. In addition, data will be presented comparing the results of the use of direct and indirect detection methods with the infant formula extraction procedure developed by the FDA. A summary of the quantitative results obtained using each analytical method was presented. In addition, our very own Greg Jaudzems will be presenting at the American Chemical Society (ACS) meeting in Boston on August 19th to talk about the influence of industrial process on 3-MCPD esters and Glycidyl esters in finished products. The presence of fatty acid esters of monochloropropanediol is a food safety concern due to the carcinogenic properties of their fat-soluble components. 3-MCPD and glycidyl esters are process contaminants formed during industrial process. Their formation has been studied over the years and it is clear that the process conditions such as time, temperature and pH play a significant role. The presence of suitable precursor is also an important part. Research and studies have focused mainly on the analysis of raw material such as vegetable oils. Indeed, high concentrations of 3-MCPD and glycidyl esters have been found in this type of raw materials, mainly due to the deodorization step of the refining process. However, the influence of the process in finished products is relatively unknown due to the complexity of the process and number of ingredients involved. In this study, infant formulae and their respective mixes of oils used for production have been analyzed. The objective is to relate 3-MCPD and glycidyl esters content from the raw material to the corresponding finish products. The results and effect of the process will be presented and discussed. The FDA has released new guidance on Dietary Fiber. The definition of Dietary Fiber has been expanded to ensure only fibers with beneficial effects on human health can be declared as Dietary Fiber on the food label. You’ll need to ensure the testing methods you are using meet the challenges of the expanded definition. Our Dietary Fiber methodology is based on enzymatic-gravimetric-liquid chromatography and meets the requirements. 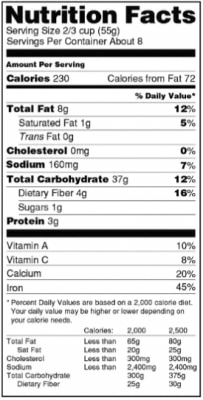 These analyses meet the FDA’s definition for Dietary Fiber that can be declared on the Nutrition Facts label. We can help you select the correct Fiber Testing, contact nqacdublininfo@us.nestle.com and one of our team members will assist you. In 2017, we renewed our ISO 17025 Accreditation with zero deficiencies. Over 99% of our analyses are accredited under our ISO 17025 certification. Our commitment to quality and reliable results is embedded in our work and demonstrated daily by our staff, so that you can feel confident in the results you receive. Thank you for visiting us at IFT 18! Over 23,000 professionals from all areas of food science including ingredients, safety & quality, suppliers & buyers, packaging, R&D and manufacturing attended IFT 18! It was great connecting with other food safety and quality professionals and learning more about the latest in our industry. Thank you to everyone who stopped by our booth just to say hello or to learn more about our expanded services. We are proud to be a part of this industry and look forward to working together and supporting your food safety testing needs in any way we can. If you would like more information on how we can support your business or if you missed us at the show and want to learn about our services, contact us at nqacdublininfo@us.nestle.com. We look forward to seeing you at IFT 19 in New Orleans! To assist with monitoring the level of veterinary drugs within your products, NQAC Dublin has recently implemented a new analytical method. This new method covers a wider range of compounds and product types while offering a quicker turnaround time for results. If you would like to learn more about our testing options for veterinary drugs in food products, please contact us at nqacdublininfo@us.Nestle.com. Centers for Disease Control and Prevention. Antibiotic Resistance Threats Report and Foodborne Germs. CDC.gov . [Online] April 14, 2014. https://www.cdc.gov/narms/resources/threats.html. —. Antibiotic Resistance, Food, and Food-Producing Animals . CDC.gov. [Online] July 24, 2017. https://www.cdc.gov/features/antibiotic-resistance-food/index.html. Barsky, Benjamin. Regulating the Antibiotic Resistance Crisis. theregreview.org. [Online] June 18, 2018. https://www.theregreview.org/2018/06/12/barsky-regulating-antibiotic-resistance/. Fabien Robert, Director, Nestlé Quality Assurance Center (NQAC Dublin) spoke about food fraud at the Food Safety Supply Chain Conference in Rockville, MD. Food fraud is the alteration, concealment, dilution, mislabeling or counterfeiting of any food product at any point in the supply chain. The impact of fraudulent products in the food and beverage industry is substantial, just one instance can lead a business to bankruptcy and have dramatic consequences on public health. The cost of food fraud for the food industry exceeds $10 billion per year and impacts 10% of commercial products sold. This symposium with attendees from across the food industry, including the FDA and food safety consulting companies, offered a great platform of discussion through multiple presentations. About 100 participants throughout the country reviewed the different aspects of food fraud and the corresponding best practices to fight it. The FDA explained in detail how Food Safety Modernization Act (FSMA) impacts this as well as the current actions being taken by authorities. The presentations provided the perfect opportunity for conference participants and viewers to gain an understanding of FDA expectations and examples of food safety programs designed to protect a company from vulnerabilities in the supply chain. Food safety programs are very important for food manufacturers as food fraud negatively impacts everyone in the food supply chain. At Nestlé, we take food fraud extremely seriously. We, like other multinational and national food companies, are engaged in the Global Food Safety Initiative (GFSI) program and have established a global food fraud prevention program dealing with economically motivated adulteration. To keep food fraud risks under control it is critical to identify, review and set a management system in place. This system includes understanding the risk factors by building awareness internally and externally, promoting best practices, developing of prevention plans with vulnerability assessment, mitigation plan and continuous review. Transparency in the supply chain, supplier audits and raw material specifications, as well as robust analytical set-up, are additional elements to consider. 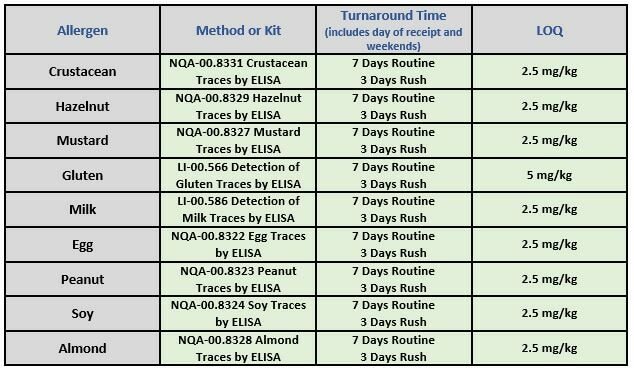 Analytical techniques when implemented with statistical analysis help to prevent food fraud today and will continue to do so with the evolution of technology. These advancements, however, will never fully replace transparency and traceability throughout the supply chain. At NQAC Dublin, we offer a portfolio of analyses to assist with identifying adulterated food products. Contact us today to learn more about our available authenticity testing to support your business needs. Did you know undeclared allergens are the leading cause of food product recalls? In a recent study, the US Department of Agriculture Economic Research Service investigated trends in food product recalls in the US from 2004 through 2013. The study found that between 2004 and 2008 the US averaged 304 recalls a year, while between 2009 and 2013 the average increased to 676 recalls per year. Based on the data, researchers were able to determine that improved pathogen and risk detection, as well as increased regulatory enforcement, were factors that contributed to this increase. When researchers analyzed the recalls by type of risk, undeclared allergens were the leading cause of food recalls. Undeclared allergens accounted for 27.4 percent of all recall events. Due to the serious health risk to children caused by not accurately labeling allergens, legislation enacted in 2006 played a huge role in the increase of undeclared Allergen recalls. The Food Allergen Labeling and Consumer Protection Act (FALCPA) ensures that food manufacturers comply with practices to reduce or eliminate cross-contamination of allergens. Contact us at nqacdublininfo@us.Nestle.com for more information on Allergen Testing. NQAC Dublin announced at the Food Safety Summit 2018 that we opened our doors to other companies in the food industry. Contact us at nqacdublininfo@us.Nestle.com for more information! As of May 29, 2018, the analysis of Dietary Fiber by the CODEX Definition is available at NQAC Dublin as the official method AOAC 2009.01 Total Dietary Fiber in foods. This method provides an improved capability for Fiber analysis. The turnaround time is 14 days including the day of receipt and weekends. AOAC 2009.01 has been verified at our location with a quantitation limit of 0.5 g/100g. The method is applicable to foods, food ingredients and raw materials consistent with CODEX Definition 2009 including naturally occurring, isolated, modified and synthetic polymers. 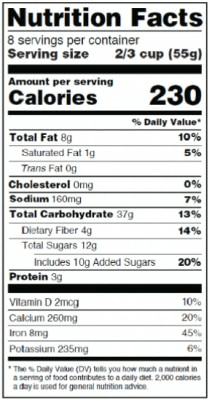 This analysis meets the FDA’s definition for Dietary Fiber declared on the Nutrition Facts Label. As of May 29, 2018 a new method for Vitamins A, E, D3, D2, K1 and K2 was implemented. This new method, LI-00.608 Vitamins A, E, D, K by UHPSFC-MS/MS, replaces our previous methods. The new method provides our customers with lower detection limits and utilizes supercritical fluid chromatography with a turnaround time of 7 days routine or 5 days rush including day of receipt and weekends. The sample preparation for food products is identical to ISO 20633:2015 for the determination of Vitamins A and E, and AOAC 2016.05 for Vitamin D and AOAC 2015.09 for the analysis of Vitamin K1. The combined method allows streamlined bench work for gained efficiency. Reported units will be: Vitamin A as µg RE/100g, Vitamin E as µg TE/100g, Vitamin D and K as µg/100g. AOAC INTERNATIONAL OMB Technical & Scientific Excellence Award Winner! We are proud to announce that AOAC INTERNATIONAL has selected one of our own, Greg Jaudzems, for the Official Methods Board (OMB) Award for Achievement in Technical and Scientific Excellence for his study AOAC Official Method 2016.03 Chloride in Milk, Milk Powder, Whey Powder, Infant Formula, and Adult Nutritionals Potentiometric Titration Method First Action 2016. He has been invited to accept the award, along with his co-authors, at the upcoming AOAC INTERNATIONAL 132nd Annual Meeting and Exposition on Toronto, Canada on Monday, August 27, 2018. The article discusses the AOAC International Inc. official method of potentiometric titration of chloride in milk, milk powder, and whey powder of infant formula, and adult nutritional formula. The methods are based on the standard performance requirements. Topics include the preparation of solutions, calculation of silver nitrate concentration for verification, and chemicals and reagents content. 30TH ANNUAL FOOD LABEL CONFERENCE! NQAC Dublin attended the 30th Annual Food Label Conference hosted by Prime Label Consultants in Washington, DC on May 21-22. The conference is one of our favorite events which is always great for networking and keeping up to date on the very important regulations and labeling changes in our industry. The conference has key speakers in the morning such as the FDA and USDA and allows the attendees to ask any questions they may have. In the afternoon, there are breakout sessions focused on various topics where you can learn in a classroom type atmosphere. This year’s sessions included important topics like Trends in Clean Labeling, FDA Nutrition Labeling & Regulations Updates, USDA Update on Mandatory Bioengineered Food Labeling, Natural Labeling, Allergen Labeling and Nutrition Label Reform. The 30th year celebration was a great year to attend, network, gain insights that you can put into practice and have your all questions answered! We learned so much and are very happy that we participated! Thank you for visiting us at the Food Safety Summit! Over 2,000 food safety professionals attended the 20th Annual Food Safety Summit in Rosemont, IL this year. It was great connecting with other food safety and quality professionals and an excellent opportunity to share the exciting news of our expanded services. We look forward to seeing you again at the Food Safety Summit in May 2019! 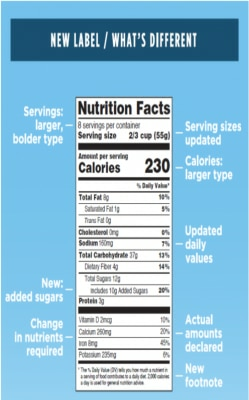 In 2016, the FDA announced new requirements for what food manufacturers need to include on the Nutrition Facts labels of their products. This is in response to consumers wanting more information about the nutrition content of their food to make more informed choices. Recently, the deadline for compliance was extended from July 2018 to January 1, 2020 for manufacturers with over $10 million in annual sales and for smaller manufacturers until January 1, 2021. Congress passed a law in 2016 establishing a mandate of the need to disclose the presence of food and ingredients from bioengineered (BE) foods. This was also in response to consumers wanting to make more informed decisions about the food they ate and what it was actually derived from. Manufacturers have several means through which they can disclose the inclusion of the BE foods: via text, icons containing “BE” or via a website. 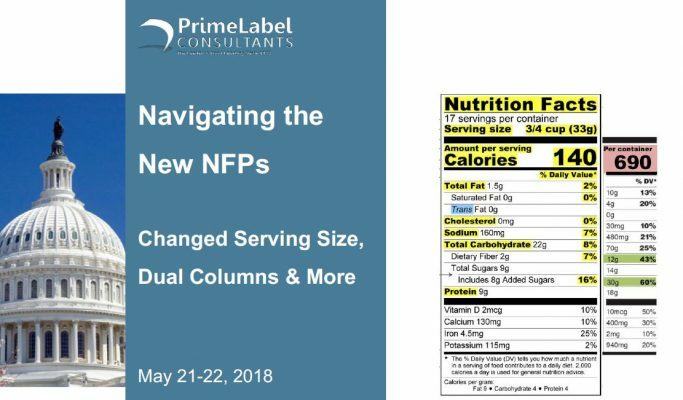 In accordance with the new Nutrition Label deadline, large manufacturers with over $10 million in annual sales will have until January 1, 2020 and smaller manufacturers until January 1, 2021 to comply with this new labeling requirement on their product. In our ongoing Based on feedback from our customers, we have made changes to how the partial and final laboratory reports are received. The ability to opt out of Partial Reports is now an option. Any testing that is In Progress (IP) is now in bold, blue text for easier identification. In our ongoing efforts to be our customers’ one stop for all their analytical needs, we are proud to announce the addition of three new methods to our portfolio of over 150 analytical methods. These methods have been brought internally to shorten the turnaround time for our customers. The analyses of Chlorate and Perchlorate were made available April 23, 2018. With our commitment of service improvement, we brought this method in-house leading to a cost and turn-around time reduction with results available by seven days after receipt of sample. This method can be requested via LI-00.043. Another method that was previously outsourced that has now been brought in-house beginning April 30, 2018 is the sensory analysis of packaging materials (Olfactory) under LI-80.017. With the addition of this method, the cost and turn-around time for our customers has been significantly reduced. Based on the comments received from our customers to bring more allergen testing in-house, we are proud to announce the addition of Mustard Allergen testing to our portfolio on May 7, 2018. The launch of this method also reduces the turn-around time and cost. NQAC Dublin is pleased to announce our partnership with the Ohio Department of Agriculture. Our team had the pleasure of supporting our local IFT section by volunteering at the Annual Golf Outing as well as the 2018 Suppliers’ Night Expo. The Ohio Valley IFT Golf Outing took place at the Hamilton Elks Golf Course in Liberty Township, OH. 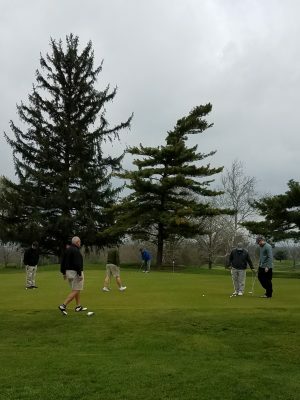 Nearly 50 OVIFT members braved the wind and grey skies to enjoy networking and a round of 18 holes with fellow members. 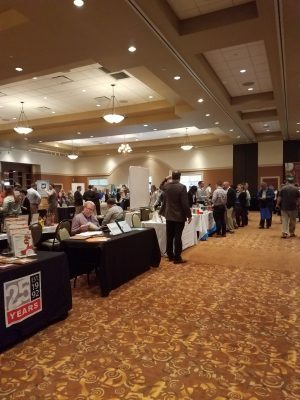 The 2018 Suppliers’ Night Expo was at the beautiful Savannah Center in West Chester, OH. Over 80 vendors and 250 attendees enjoyed a day of networking. 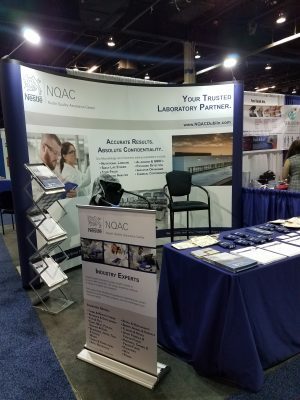 NQAC Dublin is looking forward to attending the 2018 Great Lakes IFT Suppliers Expo on 5/2 as well as the 2018 Lake Erie IFT Expo on 5/22. If you are attending either event this month, let us know, we’d love to say “Hello!”.